Spicy, colorful flavors of this Caribbean dish meld well with a sweet, cooling watermelon salsa made with pineapple, salsa, lime and cilantro. boneless, skinless chicken breast, 4 ounce each	 96 oz. 24 ea. 1. In a full-size hotel pan, toss chicken with oil to coat completely. Sprinkle seasoning rub over chicken. Toss to coat completely. CCP: Refrigerate below 40°F. at least 2 hours before cooking. Jamaican jerk seasoning	 1 tbsp. 2. 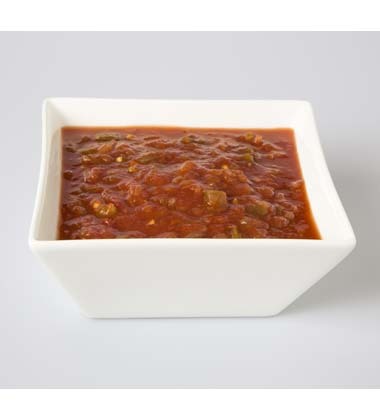 In a bowl mix together salsa, lime juice, jerk seasoning and lime zest. Whisk in oil. Cover. CCP: Refrigerate below 40°F. at least 2 hours before using. 3. In a large bowl, gently toss together watermelon, pineapple and cilantro; fold in jerk salsa and gently toss to mix completely. CCP: Refrigerate below 40°F. at least 2 hours before serving. 4. Place chicken on grill and cook at least 10 minutes per side or until meat completely cooked through and dark golden color. CCP: Cook to an internal temperature of 165°F. or higher for 15 seconds. CCP: May be served hot at 140°F. or higher, or chilled to 40°F. or lower. 5. To Serve: Using thongs, place 1 chicken breast on plate. 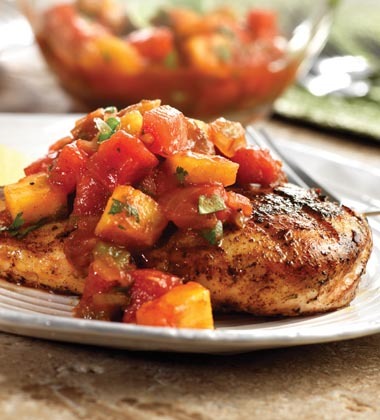 Using a #16 scoop, portion 1/4 cup watermelon salsa next to chicken. Serve immediately. boneless, skinless chicken breast	 96 oz. 24 ea. May substitute bone-in chicken breasts, thighs, or drumsticks for boneless chicken breast portions.